Between 1611 and 1613, Captain Adriaen Block explored the Northeast to establish a fur trading network with the Native Americans and to chart the coastal waters and rivers of the region Henry Hudson surveyed for the Dutch in 1609. 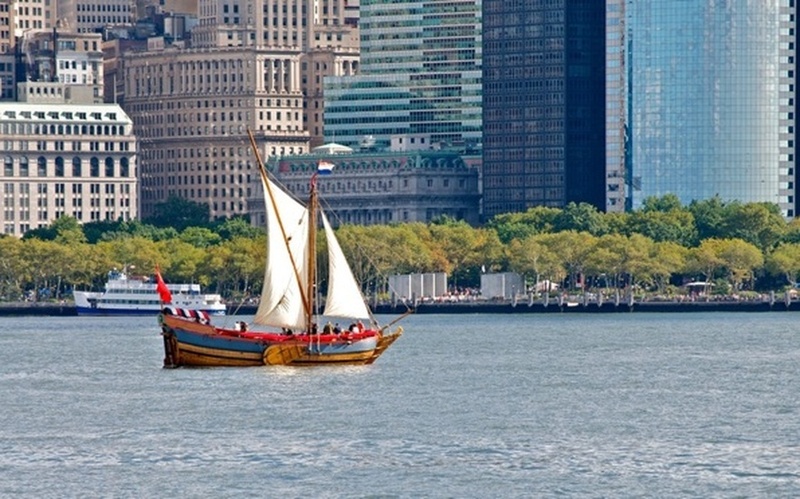 While overwintering in New York Bay, his ship, the Tyger, caught fire and burned to the waterline. Working through the frigid winter, Block built a new ship from the salvaged remnants and named it the Onrust, Dutch for “Unrest” or “Restlessness”. It was one of the first decked vessels built in America and the first in New York State. He and his associates mapped the coastal areas from Cape Cod to the Delaware Bay, including the major rivers and the locations of more than twenty significant Native American villages. Their voyages laid the basis for the future Dutch claim to the territory. On his 1614 map, Block named the region “New Netherland,” an area extending from Pennsylvania into current New England, and named Block Island after himself. The same year he established the first fur trading post, Fort Nassau, at the current site of Albany, which formed the basis for the first permanent European settlement in the Hudson Valley. The keel of the Onrust was laid in 2006 and the ship was launched in 2009 for New York State’s Quadricentennial. It was built mainly by volunteers and is made out of white oak, using recently re-discovered 17th century Dutch building techniques. As with the original Onrust, it is designed as a “yacht” and the entire ship, including areas below deck, replicates an authentic Dutch sailing craft. As a recreational vessel the Onrust offers heritage tours and as a dockside floating museum the ship educates students and adults about the early history of this area and the life of 17th century explorers and sailors. Your donation helps support ongoing maintenance and education programs!